This morning, after buying a coffee and coconut bun from a local bakery for breakfast, I made my way across the parking lot towards the bus stop. Suddenly, I noticed that I was being followed. Overhead, a flock of seagulls shadowed me. I stopped, and as many landed around me--in front, behind, on every side--I counted them. There were about 100. I thought it might be coincidental so I 'tested' the birds a couple more times. Most unsettlingly, they kept following. Flapping, conspiring, eyeing my bun, emboldening each other, staring - getting greedier and greedier. It was reminiscent of Alfred Hitchcock's infamous black-and-white film "The Birds." If very lucky, I would get out Scot-free. At worst, I would be pecked to death. Not unlikely, I would be the target for at least one of the foul bird's droppings (which I could see and hear splattering around me on the pavement) or have my hard-earned breakfast--maybe even the coffee--torn, ripped, pecked from my grasp. Hopefully I could escape without too many wounds. In light of my circumstances, I knew what I had to do. They kept following, but I eventually lost them. "Gee Mahnay," I said to an elderly lady walking carefully and slowly along the sidewalk. "Those seagulls are following me!" She laughed. "It's that bun." Armed with this insight, I concealed the bun under my shirt and tucked in my undershirt beneath it to keep it there hands-free. It was a James-Bond-like moment. As for the coffee, I figured I could risk its being exposed. 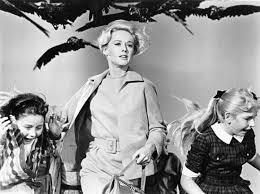 Then, I turned on my heel and faced the birds. Some now just a few feet away, they stared back. It was a face-off. I began, carefully but courageously, to walk once again towards the bus stop. It meant going through the crowd of birds. Was I safe? Would they be so easily fooled? How are sea gulls' short-term memories? Would they remember that I had not at any point discarded or eaten the bun, and deduce that it must still be on me? Was I at risk? I kept walking, the seagulls still eyeing me. They shifted to face me as I walked through them. 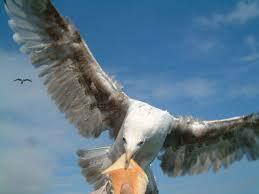 If seagulls had shoulders, theirs would have been square on me. You could slice the tension with a knife. I was a long way from a hospital, in the thick of the birds, and still a ways from my destination. Eventually, wonderfully, defiantly, victoriously, I made it past the birds, darted across the road (looking both ways of course) and made it not just to the bus stop but, fortuitously, a waiting bus; at a red light. Just in time. "I just got attacked by 100 seagulls," I said to the driver, proceeding to embellish the story with details of the ordeal. It then occurred to me how incredulous I must have sounded. After all, crazy people love bus travel and this man had no doubt encountered hundreds. Then, from my vantage point just inside the door, I noticed that the bus was full. And quiet. No one was smiling, and many eyes looked, nervously, in my direction. They, too, had heard my story. They, too, had encountered bus crazies. Every seat was taken, so I made my way, awkwardly, towards the center of the bus. I felt alone, and surrounded--as I had amidst that crowd of bloodthirsty seagulls. "At least I'm alive," I thought, as I sipped my coffee. Yes, you have certainly certainly lost it. Good for you Nigel - I was at the monkey bar park last night and was a victim of an air attack - I did my best with a bottle of water but Holly wouln't come near me (after she stopped laughing)..Many of our neighbours assured me that it meant good luck (this belief seems to cross all cultures...) but it didn't feel too lucky at the time!! Next time, toss the bun one way and run the other. A warm delicious bun is one thing, losing your life and staining your pride (not to mention jacket)is quite another. A bun in the hand is worth...well, it's just not worth it. I'm so glad that you [and the bun] reached the bus unpecked and unscathed. I can just imagine, though, how mad you must have seemed! Having said that - I was thinking about this story last night, and realised that we have something to learn from the bun. I enjoyed the story, although I'm sure enjoyment wouldn't be what you experienced at the time. :0( I do remember the seagulls from my time at Cedar Point...they are a vicious, beggarly lot!